Here in Atlanta, the whole farm-to-table conversation seems to be at a fever pitch. We are reeling from the pending departure of two of our most talented chefs – Nicolas Bour and Michael Tuohy – whom are both huge proponents of the farm-to-table movement. While I wish both of them the best of luck with their moves, it has made me think about our dining scene here in Atlanta. With celebrity chefs moving in, two restaurants opening for every one that closes, and a fairly substantial farmstand/CSA presence here…why can’t we support farm-to-table eating here in our restaurants here? One of the people here who has been doing it very successfully is David Sweeney at Dynamic Dish. This little sparkling gem in a rough, transitional part of town has a cult following among foodies in Atlanta. His approach is simple: all organic, mostly vegetarian…and all purchased the day or so before it’s prepared. I have run into him scouring the farmer’s market for whatever looks fresh that day. There is no set menu – you trust his palate and his combinations of tastes and textures. The salad in this post was inspired by one I had at Dynamic Dish. The softest, lightest organic red leaf lettuce acting as a cushion for organic black mission figs, chunks of Sweetgrass Dairy chevre, and toasted pumpkin seeds. I whipped up a quick dressing of honey, balsamic, wonderful olive oil, sea salt and pepper. 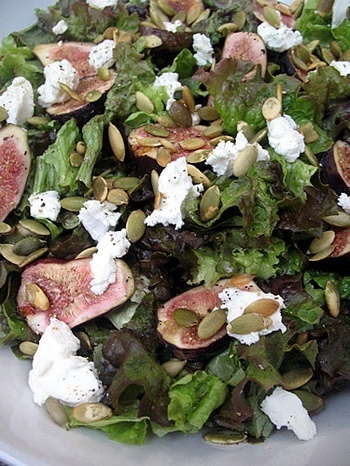 It was a marvel of textures with the airy lettuce, ripe figs, and creamy goat cheese. All thrown together in an impromptu way with whatever looked incredible that day. Next week, I will be taking part in a week long Eat Local Challenge sponsored by Whole Foods here in Atlanta. It’s something I have wanted to try for a long time – I buy lots from the local markets but not 100% – and this is the perfect opportunity. With the exception of a meal out for Downtown Restaurant Week, everything I eat will be fresh and locally grown. I will be trying to blog about my creations as much as I can. I will be documenting it on Flickr as well in a special photo set. Follow along. Contribute. Better yet, eat local with me! We’ll be participating in the Eat Local Challenge on Atlanta Dish as well. I might steal some meal ideas from you! This salad looks/sounds delicious. When are you going to cook/assemble for me? I can’t wait to hear about the WF-sponsored Eat Local Challenge. For weeks now I’ve been on the verge of writing a blog post slamming WF for the lack of locally-grown/procured products in their DC locations. They seem to do a great job of marketing the concept, but not really walking the walk. The reason I’ve hesitated to slam them via my blog is because they do some good, generous things for some DC orgs I’m involved with. But on any given day I walk into the WF in my hood and am lucky to find a single variety of fruit grown within 200 miles of DC . . . when the local farms are bursting with seasonal fruit. It’s peak season for DC-area fruit and on a visit to WF last week, the most local fruit in the store were some peaches from South Carolina. I can’t help but think they cultivate the notion of local foods purely as a marketing tool, thinking that if people see the WF name on “local” food events often enough, they’ll presume the stuff WF is selling is actually locally grown . . . without reading the in-store point-of-origin signage. This frustrates me. What’s your take on WF? We have a “Farm to Fork” week here in NJ. Same kind of idea though where local restaurants feature 3 course meals made from locally grown foods. omg I seriously just want to do a face plant on that salad. I love figs. I’ve been to Dynamic Dish and I have to give my testimonial; Awesome. The food was really that fresh and so good. Cheap codeine. Liquid codeine how to make. Codeine available in dallas texas hospital. Extracting codeine from promethazine.